I Love You Messages for Ex-Boyfriend: Take ideas from this post to write a sad quote about heartbreak if you want to tell your ex that you’re still in love with him. Show him how big a mistake he made by walking away from the relationship. Maybe your romantic words will hit the sweet spot in his heart, and make him come back to you. But think hard before giving him the slightest of hints that you’re missing him even after your breakup. Do it only if you’re sure that you want to get back with him. Sending messages and texts to your ex is never a good idea unless you really want him back in your life. If you want to be subtle, post a cryptic selfie on Instagram or Facebook. You could even rant your heart out in cute tweets that you think might give him the signal. 1) I don’t want the tears to stop rolling down my cheeks, I want you to come wipe them off. I don’t want my heart to heal, I want you to come fix it. 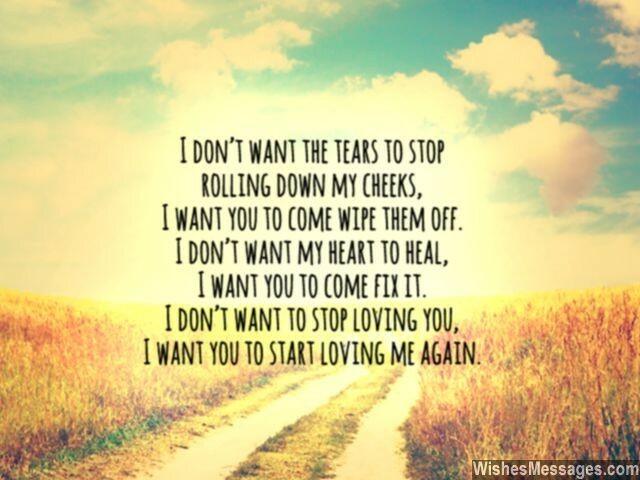 I don’t want to stop loving you, I want you to start loving me again. 2) Is it wrong that I still love my ex-boyfriend? Then why doesn’t he come to me and make it right? 3) I don’t want to move on and give our relationship a friendly ending. I want you to take me back in your arms and give it a new beginning. I still love you. 4) You may have broken up with me but I want to remind you that nothing can stop my heart from loving you… not even you. I love you. 5) I promise to help you achieve all your dreams, even though you have shattered mine. I promise to be perfect, even though you show me my imperfections all the time. I still love you. 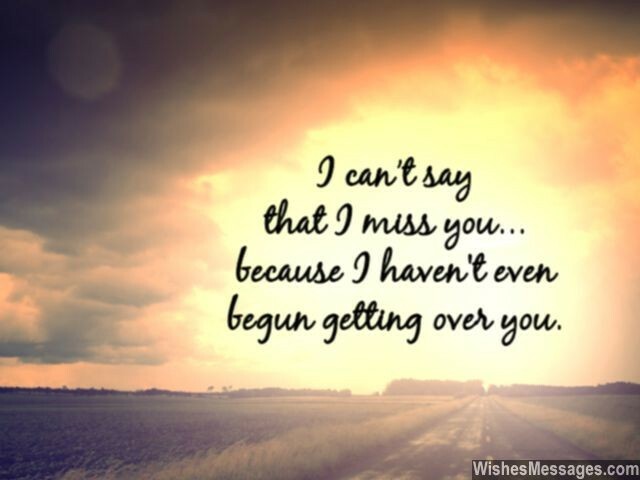 6) I can’t say that I miss you because I have not even begun getting over you. I still love you. 7) Maybe our relationship wasn’t meant to be, but you mean everything to me. Let’s try to be lovers and not mates, I still believe in love’s beautiful fate. I still love you. 8) We live once and we die once… and our love is definitely not going to be a regret. I love you. 9) I don’t care that you don’t love me anymore. All I care about is that I love you and I want you to be mine, even though you don’t want me to be yours. 10) My friend asked me if I needed any help moving on and I replied ‘No, I need help getting him back’! I still love you boy. 11) You hurt my feelings, you broke my heart, you made me cry, you left me alone and yet I wonder why, I still love you. 12) Our breakup made me cry but in some way, they were tears of joy. Being away from you has just re-affirmed to me that my heart belongs to no one else but you. I love you. 13) My life survives on Hope – the hope that you will come back, and the hope that you will whisper I Love You in my ears. I still love you boy. 14) If our relationship is the past and our breakup is the present – I live in the past, pretending that the present is just a silly nightmare, hoping that the future will be a dream come true. I love you. 15) I still remember the day when you swore you would never talk to me again. But I want you to remember that there was a day when I swore that I would never stop loving you. One of us will have to break our promises… and it is definitely not going to be me. I love you. 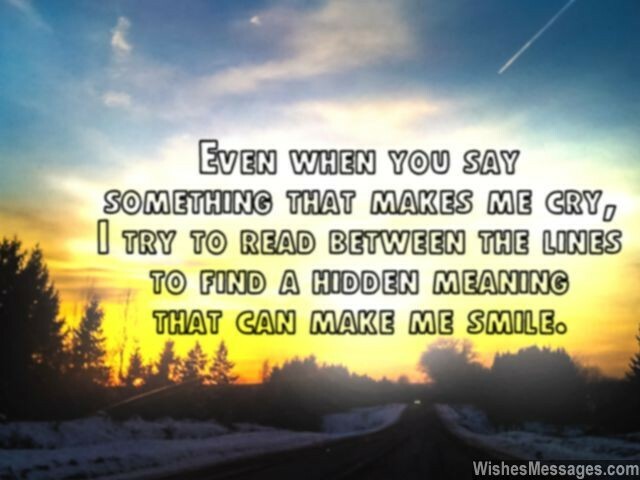 16) Even when you say something that makes me cry, I try to read between the lines to find a hidden meaning that can make me smile. I still love you. 17) Every time I look into your eyes, I see nothing but Hate for me. Yet, when I look into my heart, I see nothing but Love for you. 18) I haven’t been texting you for a while, hoping that a tender corner in your heart will make you text me. I still love you. 19) I am a heartbroken girl, weeping her sorrows away. You are the boy, who can hold her in your arms and save the day. I love you. 20) As every second passes, I wonder what you must be doing. As every minute gets over, I wonder what you must be thinking. I miss you more and more, as every day goes by. I can’t hold back the endless stream of my tears… even though I desperately try. I love you. 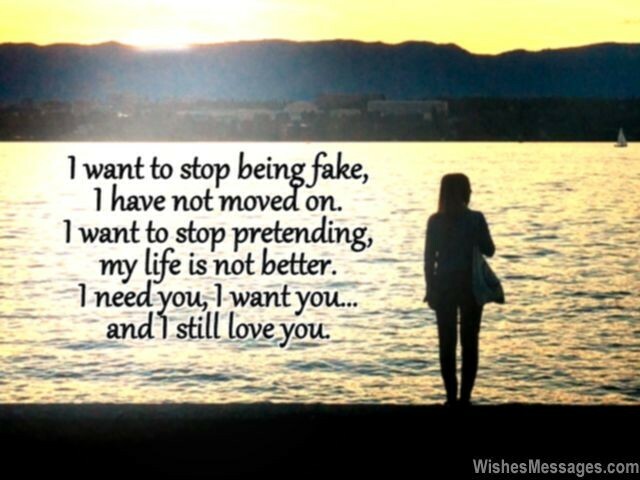 21) I want to stop being fake, I have not moved on. I want to stop pretending, my life is not better. I need you, I want you and I still love you. 22) I was simply a file on your life’s hard drive which you deleted. Whereas you are my hard drive on which all the files of my life have been stored. I will never be able to stop loving you. 23) I am tired of acting as if I am okay with the breakup, because I am not. I am tired of showing that I have moved on, because I haven’t. I am tired of pretending that I don’t love you anymore, because I still do. 24) How easy was it for you to say that you did not want me in your life? I wish I could do that but I can’t because you were, you still are… and you will always be my life. I love you. 25) After you dumped me I have been crying day and night, but I don’t mind. At least I am thinking about YOU. I love you. 28) I don’t mind if you want to pretend that you love me and break my heart again. Even your fake love is better than any other love out there. 29) Forget moving on, forget standing still – my life has moved backwards since we broke off because I am continuously living in the past. I miss you and I still love you. 30) As your ex-girlfriend I don’t have the right to just knock on your door and fall into your arms. But I still think that you have all the right to knock on mine and take me into your arms. I love you. 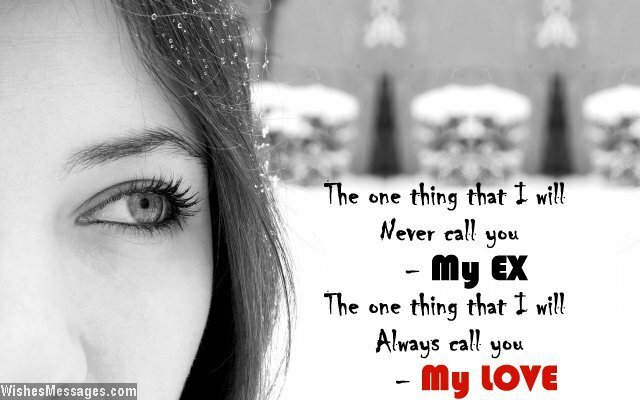 31) The one thing that I will never call you – My Ex. The one thing that I will always call you – My Love. 32) How can I call you my ex, when my heart still beats for you? How can you say that our relationship has come to an end, when in my mind, I am still your girlfriend? I love you. 33) Everyone knows that I still love you, and I don’t care if my friends think I am a loser. I would rather be a loser with a heart full of love than a heartless and popular. 34) I know you ignore me. By my side, I know you don’t want to be. I know you don’t like me anymore, I know my texts make you feel sore. But no matter how much you despise being together… my heart will love you forever. I love you. 35) All my friends tell me that you don’t deserve my love and I don’t deserve your heartlessness. But I will always follow my heart’s direction which is permanently pointing towards YOU. I love you. 36) I sit here by the window with a hot coffee mug. I wish you were here to give me a soulful hug. 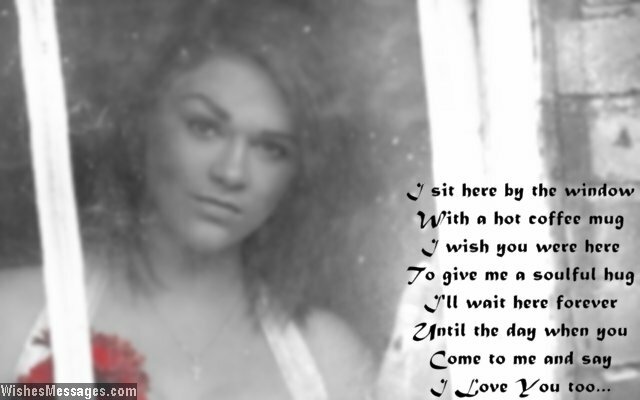 I’ll wait here forever, until the day when you… come to me and say I Love You too. 37) Let’s stop pretending that things are okay and we are just friends. Because things are not okay and I want you back as my boyfriend. I still love you, and I always will. 38) Ever since the day you threw me out of your life, I have been falling in a bottom less pit. I will continue falling until you come and catch me. I love you. 39) I don’t care if you break my heart once, twice or thrice. Your love is my life’s addiction, dependence and vice. I love you baby. 40) You have distanced yourself from me, but our love is still my life’s key. You have walked far away, but I miss you every day. You may be moving on in life, but I am still stuck in pain and strife. I love you.